Leading Wholesale Trader of metallurgical image analysis system - microcam, metallurgical image analysis system - metal 11.1, advanced metallurgical image analysis system, advanced metallurgical image analysis system - ri and advanced metallurgical image analysis system - ri metal 1.0 from Pune. Micro Cam is designed to study control the micro structure of Metals Alloys. This software is useful for inspection, quality control R D in various industries like Steel, Iron Casting, Aluminum, Copper, Light Heavy Metal forging, Fastener, Automobile many more where microstructure is to be analyzed for quality control. Easy User friendly menu for analysis. Step by Step easy procedural inbuilt modules, including Linear Measurement of Captured images and Report Generation. Grain Size : With accordance to DIN, JIS, ASTME 112, ASTME 1382, with various methods like Manual Trace, Comparison Method, Single Grain measurement, ALA Interception method. Phase Percentage : Identify multiple phases within Micro structure. Also delineate phases from the histogram as per ASTM Standard E562 E1245. Layer Depth : To Measure depth or width of decarburisation / carborisation as per ASTM 1077 standard. Coating Thickness : This application rapidly measures the thickness or width of a coating at multiple positions along a sample as per ASTM B487 standard. Nodularity in accordance to ASTM A247 MEASURE Nodularity as per ASTM 247 standard. The Nodules Flakes are separated on the basis of its shape and aspect radio. Reports : Report generation facility into MS Excel or Customized Form Built in for user. 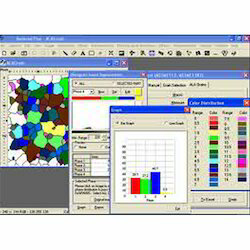 Metallurgical image Analysis Software Metal 11.1. RI STRUCTURE 5.0 : It is flexible and powerful software solution that enables you to acquire, measure And analyze your images. 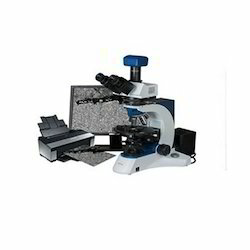 It can be used for processing both general lights Microscopy images and electronic microscopy images. The needed data quickly and efficiently with a minimal level of effort and user Involvement. Additional methods of automatic analysis can be easily created. Simplicity of the routine’s creation makes it indispensable to investigators. 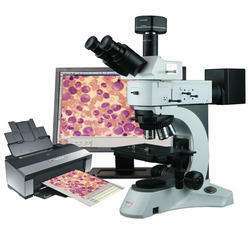 Working with series of images corresponding to one experiment or specimen is Carried out within one electronic document. All current experiment information [Images, comments and measurements data] is saved as one file. It makes a Concluding data analysis convenient adn easy. Adjustable template for printing results. This feature allows you to integrate Images, sample information, analysis data, tables and graphs into one document Without leaving the analysis software. Built-in image database is a useful tool both for information storage, search, Systematization and extracts made on specified criterion. RI-Size 5.0 software is designed for image acquisition, annotation, enhancement, and measurements with statistical processing of the measure data. The series of images can be acquired, analyzed and saved within the same document. B/w or color image acquisition with CCD / digital cameras (including 10, 12, 16 bit), scanner, open from files, paste from the clipboard. Ability to work with series of images and analysis results within one document. Convenient switching between images and data. Save series of images and data to the same document. Ability to display the images in different false color palettes. Image annotation (text, graphics), moving, copying, rotating of outlined image area, zooming in and out, exchanging of graphics between images. Ability to obtain a resultant sharp image from the series of images acquired with various focus depth. Manual measurements (linear, angle, radius, distance between two parallel lines, etc. ), count objects. All measure data are displayed in the spreadsheets. Automatic measurement of the areas (objects) manually outlined. Statistical treatment of the measurement results, data export to MS Excel. Ability to create multi-page reports. Save and print images and analysis results. Built-in image database with easy-to-use and powerful filtering abilities can store images, analysis results (objects, measurements, comments) and supporting text information. VideoTesT-Size 5.0 has user-friendly interface, flexibility, and provides high speed of image processing. RI Metal 1.0 software is designed for image acquisition, annotation, enhancement, and measurements with statistical processing of the measure data. The series of images can be acquired, analyzed and saved within the same document. Ability to analyze multiple samples of similar type for multiple images from each sample and analysis on the accumulated data from multiple sample and their multiple analysis. Minimum 6 samples. Ability to process images with size of 1024 x 980 pixel or higher. Built-in charts for GOST/ASTM standards to compare and justify the results from automatic analysis. Fast switching between different standards. Automatic measurement of analyzed area for individual and total analyzed area. Calibration of images and automatic overlay of calibration scale for all image size. Ferrite content in Austenite steel bar. Carbide inhomogenuity in alloyed tool steels. Length of Marstenstitic lenghts needles. Carbide Morphology Distribution As per SEP 1520 to determine Spheroidize structure, the Amount of perlite, Micro inclusions, Carbide network and Carbide streaks (bandings) in a given material. 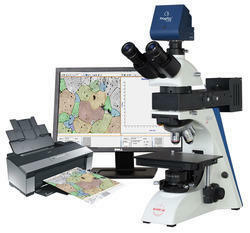 Looking for Metallurgical Image Analysis System ?